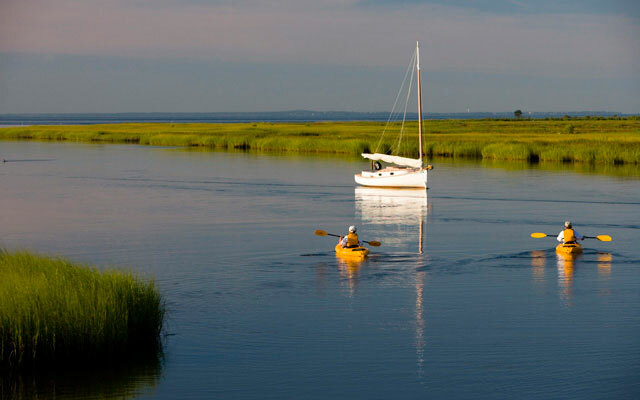 The current and future resilience of Connecticut’s coastline and waterways depends on our ability to visualize change, plan wisely for the future, and take action today to avoid future costs to the economy, citizens and environment. Despite a growing awareness of the risk posed by extreme weather and climate change, communities and local decision-makers often have limited access to the information and tools they need to protect people and nature through actions that reduce risk from hazards. In Connecticut coastal property and critical infrastructure is only inches above existing sea level, putting billions of dollars in public and private investments and business at risk. Natural infrastructure, like coastal wetlands, beaches and dunes, and river floodplains, that provide important defenses against storms for people and property are also at great risk. With the right tools and a community-based process it is possible to responsibly plan for future resilience and decrease community vulnerability while including natural infrastructure. To address this need, the Nature Conservancy’s Connecticut Coastal Resilience Program provides a decision support platform to better inform a process for decision-making and the implementation of socio-economic and natural infrastructure based solutions. Increased flooding from Nor’easters, extreme storms like Irene and Sandy, and sea level rise affects people’s lives, livelihoods and their environment in Connecticut. Losses of homes and wetlands from more frequent and severe storms are critical management and planning issues. At the heart of the challenge are the decisions we have made in neighborhoods, municipalities and across the state for the last 300 to 400 years about what goes where and why along our coastline and waterways. Naturally, many of these decisions have been made without a full understanding of risks from an increasing number of hazard events. Ongoing development and redevelopment that does not factor in the risks will increase the overall cost to society that we are now sharing in the aftermath of Sandy and Irene due to decisions made a century ago in some cases. Thanks to tools and programs like Coastal Resilience we can now see and plan for the future here in Connecticut and help to avoid future costs to our economy, society, and ecosystems. Human Populations: With a third or more of the state’s resident’s living along the coastline, Connecticut has committed to a high level of exposure and vulnerability. This highly developed coastline is now changing at an unprecedented rate, expressed not only environmental challenges but also social and economic ones. A good deal of these states’ coastal private property is only inches above current sea level, which puts billions of dollars in public and private insured assets at great risk. With an estimated $405 billion in insured assets, the Connecticut coastline is particularly vulnerable to accelerating coastal hazards. Nevertheless, social and economic factors continue to make building in coastal areas both desirable and legally and economically feasible. In many cases, the significant importance of natural resources such as barrier islands, dunes, shellfish reefs, and tidal wetlands that provide critical habitat and help keep people and property safe from hazards are not properly valued and incorporated into planning and adaptation implementation. Infrastructure: Infrastructure at risk from flooding in Connecticut includes, but is not limited to, commercial, industrial, and residential buildings, roads, railroads, airports, and sewage treatment facilities. The distribution of these types of infrastructure along our coast can be mapped in the Coastal Resilience tool, and impacts to these resources can be determined under various sea level rise and/or storm surge scenarios, thus identifying current infrastructure at risk. In addition, coastal resilience mapping can help planners envision the placement on new infrastructure in places that are less susceptible to future damage. Tidal Marshes: Among the most productive ecosystems on Earth, tidal wetlands perform many functions that are highly valued by society, called “ecosystem services”. Wetlands protect coastal water quality by filtering land-derived nutrients and contaminants; they are an important component of the coastal food web; they provide valuable wildlife habitat. Most importantly though, tidal wetlands help to defend and keep people safe from flooding and erosion associated with storms. In sum, wetlands help sustain our coastal defenses and health of our coastal ecosystem and the recreational and economic activities that depend on it. Beaches and Dunes: The beaches and dunes that fringe Connecticut’s coastaline provide protection from storms and storm surge for the human communities along the mainland coast, but they also serve as unique habitats for many species. The Coastal Resilience Program provides the science, tools and community-based process to support adaptation actions on the ground within neighborhoods and in the policy arena across the state of Connecticut. At the heart of municipal, state, and regional planning is the intent and requirement to implement solutions that will help a given community by ultimately improving the quality of life for residents, the economy, and the environment. At its best, planning provides a proactive process that incorporates all credible information and stakeholders to guide decisions that help realize a future vision for communities in Connecticut. One of the critical issues we face today is the projected impacts to our coastal communities from climatic changes that are underway. In order to provide practitioners with a better understanding of how other communities are facing this issue, the Coastal Resilience Program scoured the country to find strategies being used by states, counties, and municipalities to address coastal and inland change and increase the resilience of their communities. Provided shortly will be a summary of the most prominent approaches and tools for coastal solutions being employed around the nation. Each of the approaches and tools are organized by type and scope and supported by a specific case study. The intent is to provide you with a comprehensive collection that can be used to incorporate projected changes to our coastline or address the issue directly. Bill signing ceremony with Connecticut Governor Malloy for Public Act 13-179, which requires town and state planning to include consideration of NOAA sea level rise scenarios. 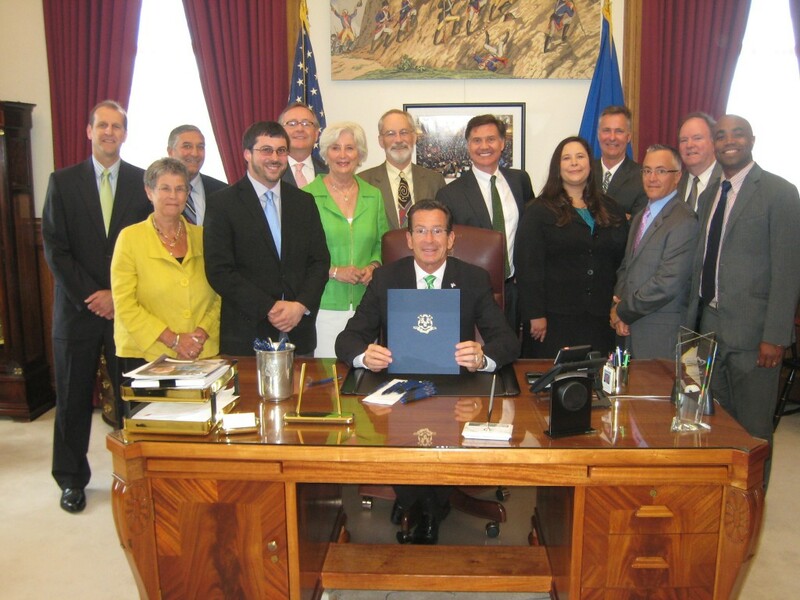 Photo courtesy of Governor Malloy’s office. At the heart of the Coastal Resilience Approach is the use of natural infrastructure as an alternative or compliment to traditional, hard-engineering projects. These solutions can include restoring or protecting habitats that protect our coastal communities. Click here for more information on the types of habitats that can act as natural infrastructure. For the latest reports, paper and other publications on coastal resilience in Connecticut visit the Resilience Resource Library on the Conservation Gateway. Partners in Connecticut use Coastal Resilience to inform restoration in Bridgeport, CT and beyond.